of Cambridge Street, Manchester (1914); Works Warehouse: Cambridge Street, Oxford Street, Manchester. 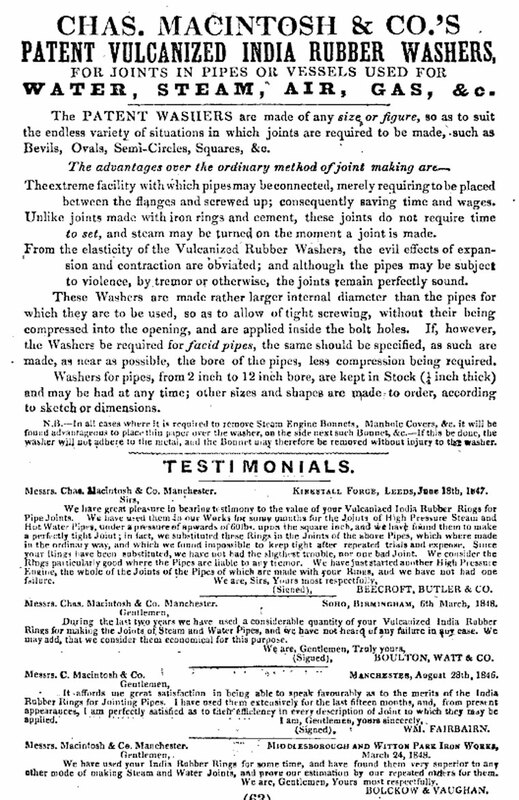 Wholesale Warehouse: 19 St. Bride Street, Ludgate Circus, London, EC. 1792 Glasgow had begun to introduce gas lighting into the streets, as well as a few prestigious properties. 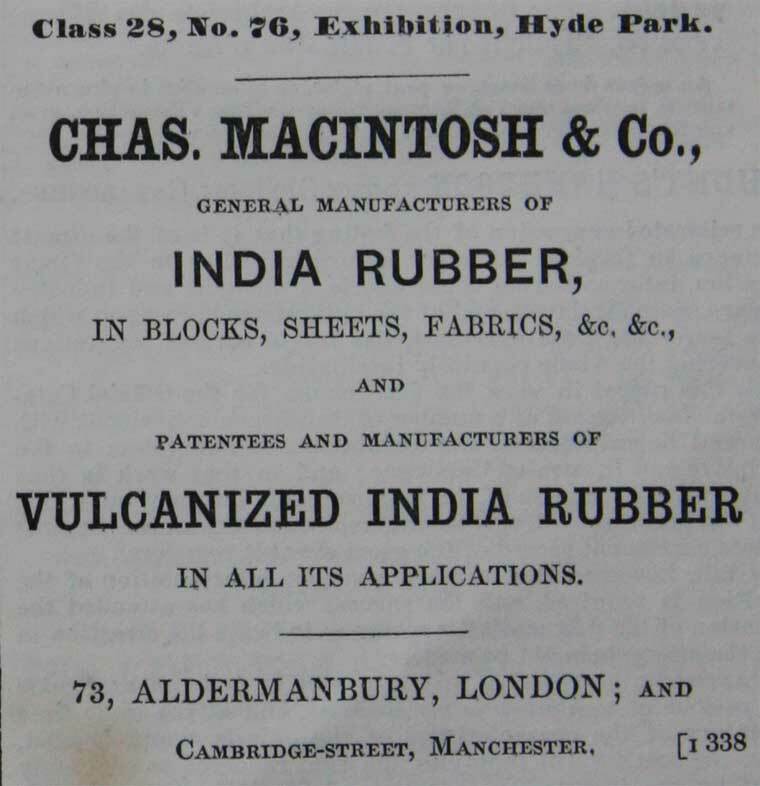 While he was trying to find uses for the waste products of gasworks, Charles Macintosh discovered that coal-tar naphtha dissolved india rubber. 1797 He opened the first alum works in Scotland and, with Charles Tennant, developed a dry bleach made from chlorine and slaked lime. This made him a considerable fortune and enabled him to research into various other fields of chemistry. 1817 The Glasgow Gas Light Co was formed. 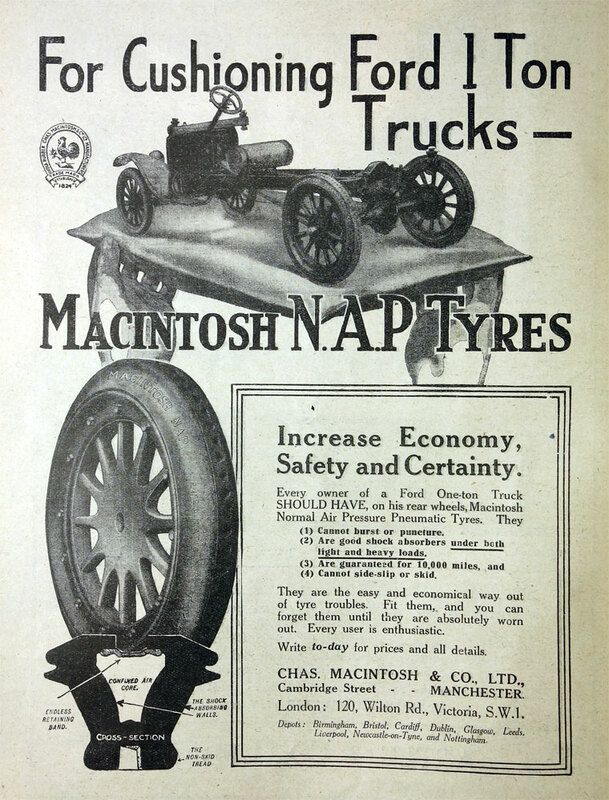 The gas was produced from coal and Macintosh contracted to buy the waste products as he could extract ammonia from them which, in turn, could be used by his father’s company to make the violet-red dye cudbear. He was still left with a further waste material – a mix of organic liquids called collectively coal tar naphtha. 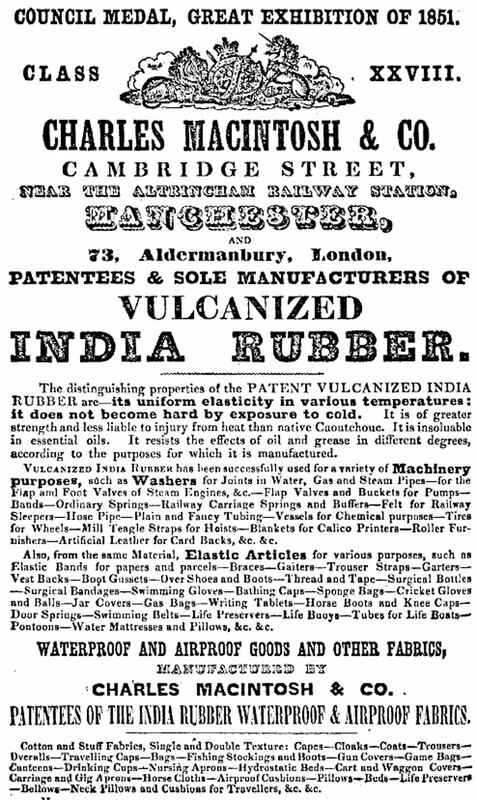 1818 As early as 1791, Fabrioni had remarked on the excellent solvent properties of this for rubber but he seems to have been ignored and it was not until 1818 that J. Syme proposed that “a substance from coal tar” could be used as a rubber solvent – and noted that it was cheap and readily available with the new gas lighting. 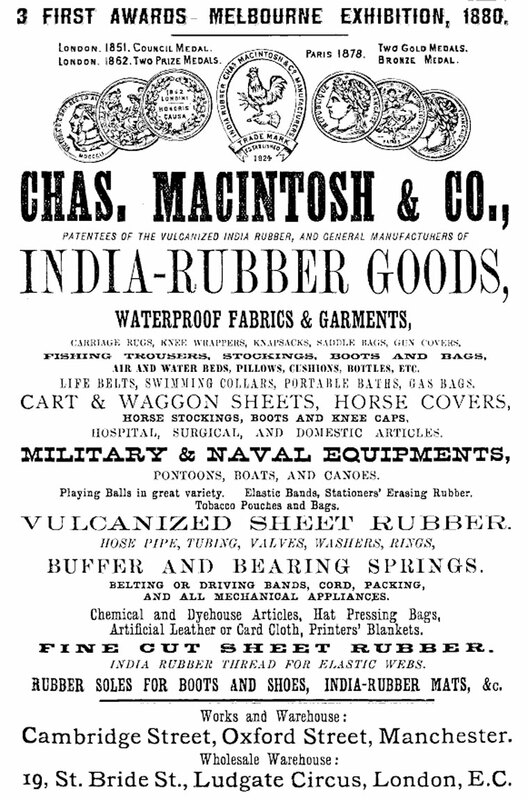 1818 Charles Macintosh discovered that a rubber solution used between two sheets of cloth made the resulting cloth rainproof. 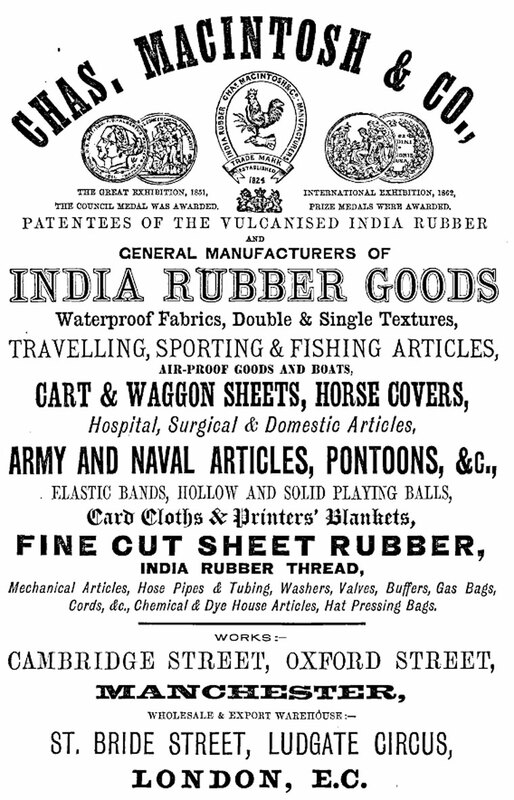 1823 The practice of coating cloth with rubber latex to make it waterproof had been known to the South American natives for centuries, but as latex was too unstable to be shipped to Europe, the industry had been waiting for just such a discovery. Macintosh began experimenting with this material as solvent and found that the resulting fabric was waterproof - it was also sticky and smelt foul. His idea to avoid the stickiness was simply to press two sheets of fabric together with the rubber sandwiched between them. This he patented in 1823, but the smell remained. 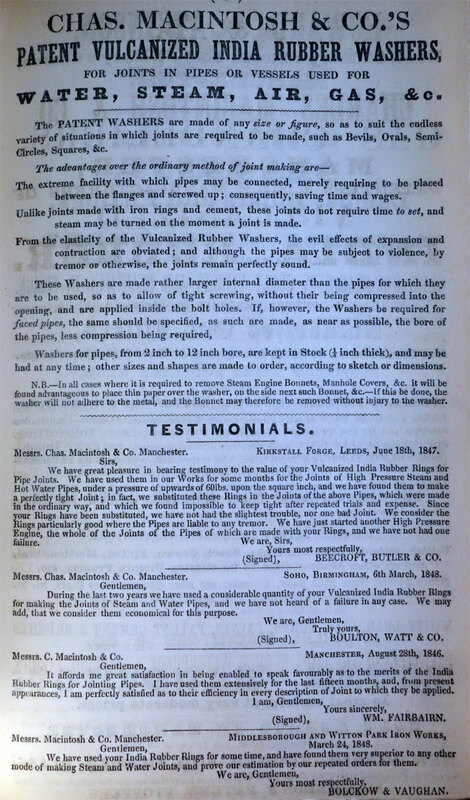 1824 Macintosh persuaded the Birley brothers, cotton spinners and weavers of Manchester, to build a factory next to their mill (presumably later to become Birley and Co) in which he could manufacture his rubberized cotton. He met with numerous problems and his cloth was shunned by society although there was a large and steady demand from the armed forces and merchant navy - despite the smell. Macintosh was punctilious about replacing unsatisfactory products, or giving cash refunds and, ten years on, the factory was still not profitable. 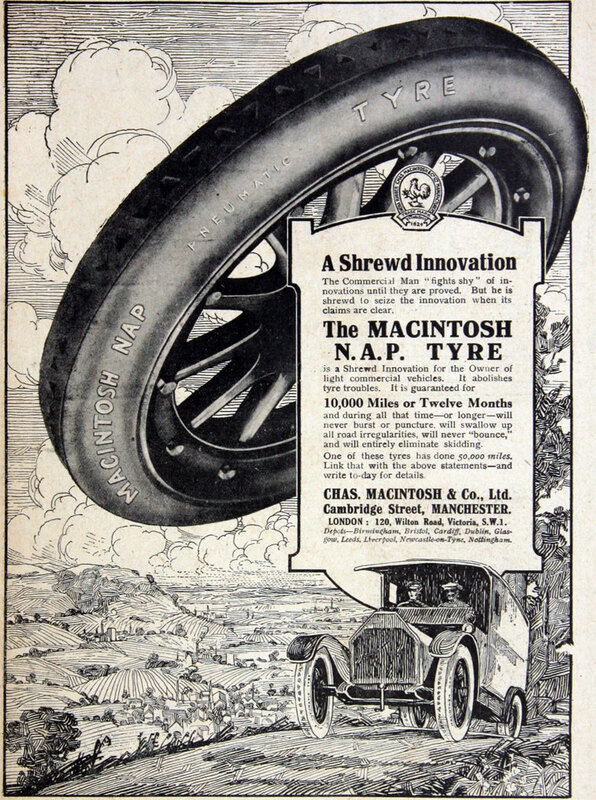 1825 It was then that the ‘father of the UK rubber industry’, Thomas Hancock, stepped in. He was aware of Macintosh’s work and took out a licence to manufacture the patented “waterproof double textures”. 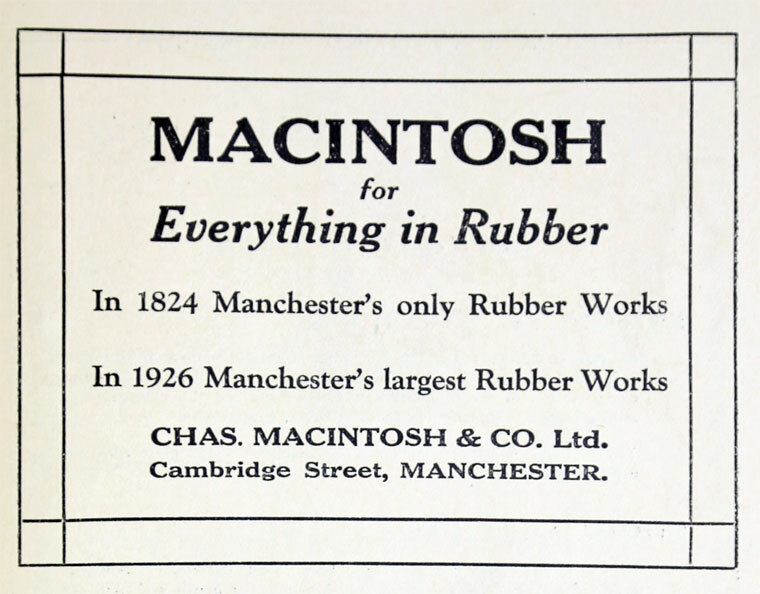 Hancock’s solutions were able to have a higher rubber content than those of Macintosh. This gave a more uniform film on the cloth with less penetration through it and with less odour. Hancock quickly realized that his products were significantly superior to those of Macintosh, and eventually, with much secrecy on both sides, they co-operated, although remaining separate corporate entities, to improve their products. 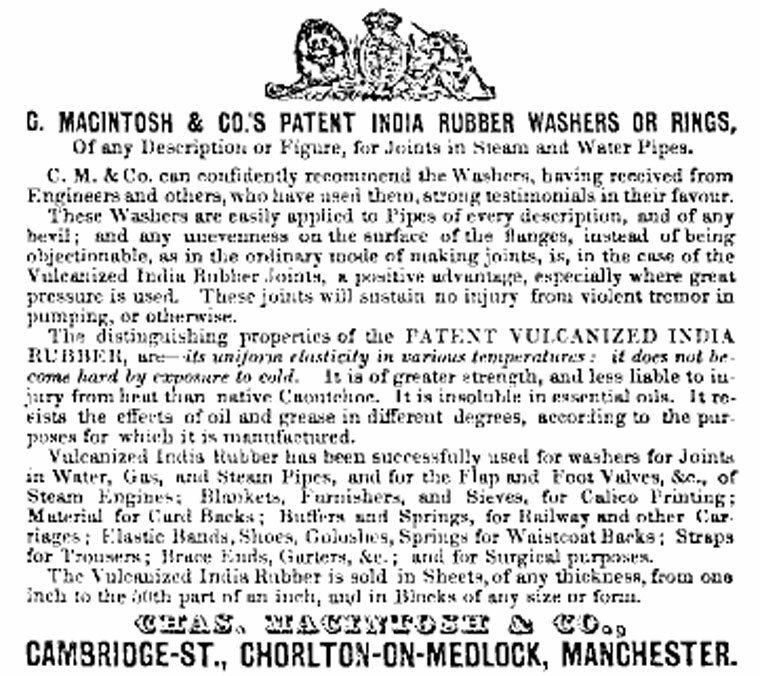 1831 Mutual trust slowly developed and Thomas Hancock became a partner in Charles Macintosh and Co, their two companies merged and two years later the combined company bought Thomas’ brother’s specialist rubber business which manufactured a range of rubber medical devices. 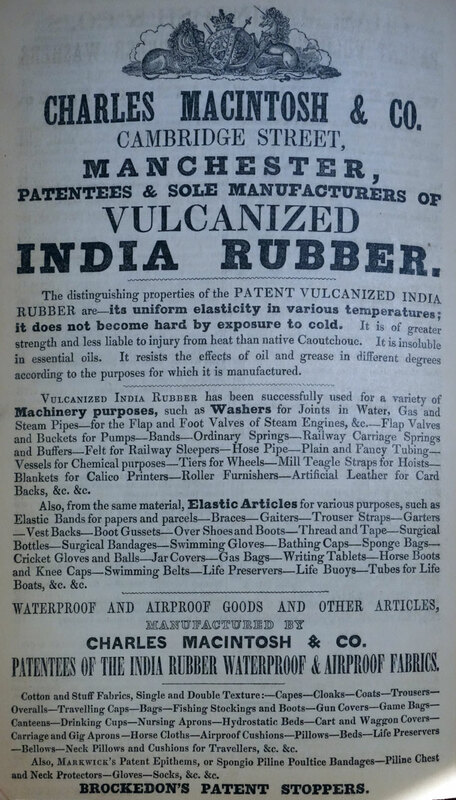 The discovery of vulcanization, initially by Goodyear in the US and separately by Thomas Hancock in the UK in 1843/4, completely altered the fortunes of the company which was now able to produce a vast range of products made from both vulcanized rubberized fabric and solid rubber. 1846 The company purchased the 'cold cure process of Alexander Parkes for the sum of £5,000. 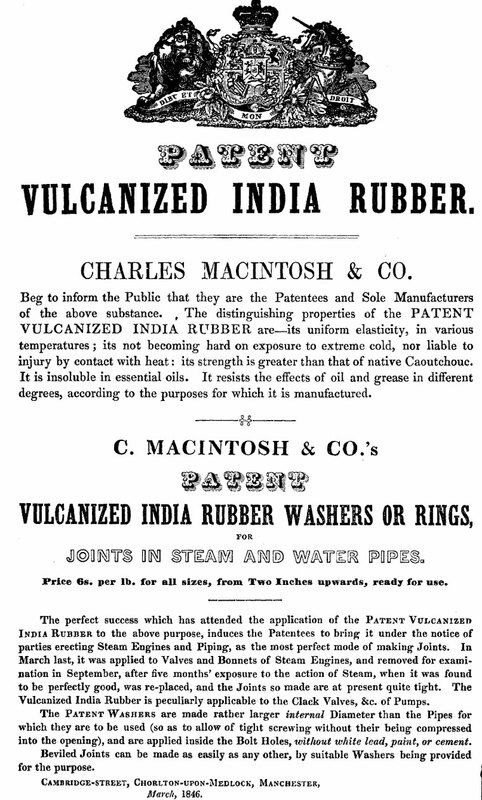 This then enabled thin sheets of rubber, or single texture fabrics, to be vulcanized using sulphur chloride, initially in solution but later in the gas phase. 1851 The award-winning stand of Charles Macintosh and Co at the Great Exhibition, set it on the road to financial security. 1875 Laid some rubber pavement outside St. Pancras Railway Station which was still in good order in 1899. 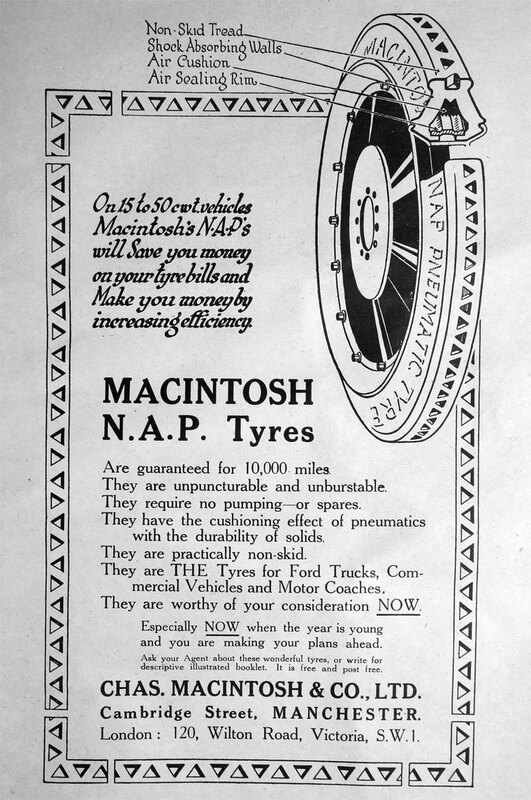 1889 The company was incorporated as a private limited company. WWI During the War there was a large demand for material such as ground-sheets and airship and balloon cloths, and waterproof garments. 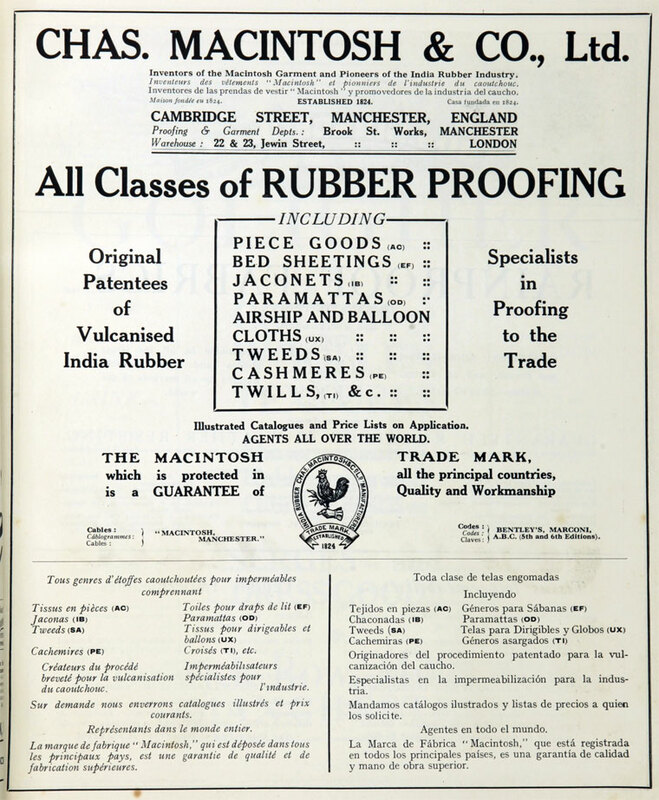 1918 The manufacture of rubber proofed fabric, and the design and manufacture of water proof and shower prooof garments was transferred from the Cambridge Street works to the more commodious factory in Brook Street. 1940 Original factory was destroyed. 2000 The Dunlop Company used the mill until February, when it closed. The present factory is now the centre of a regeneration programme for the ‘Southern Gateway’ to Manchester. This page was last edited on 10 December 2016, at 07:28.